Barcelona Photoblog: Are Photography Composition Rules That Strict? Are Photography Composition Rules That Strict? To be honest Carlos, for me the attention was drawn to the girls behind. Someone else would have said: "rules are made for photography, not photography for rules." I try not to follow any rules when it comes to photography. But it's hard sometimes. Poor Carlos - everyone seems to have turned their backs to you! Ha! Nice snap on the street! No soy capaz de imaginarme la ciudad de Barcelona sin turistas. Forman parte de la imagen de Barcelona. Un saludo. Never heard nor thought much about this subject before. Trying to melt as much of the environment into a scenery, I might indeed be in exceed of some rules. Thank you though very much for teaching. Please have a good new month. My attention is drawn to the girl with the blonde hair who is walking away. Yes, my friends, that is precisely what I meant. 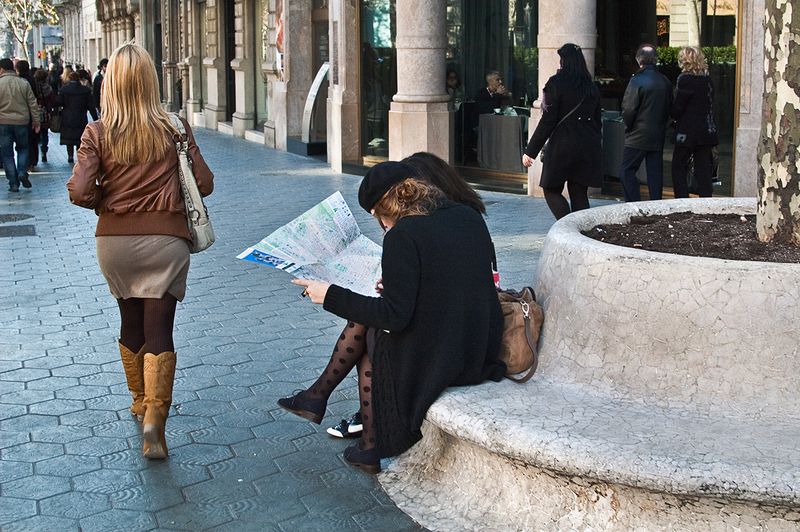 No use trying to concentrate on the girls with the map, the nice beret or the modernist bench. Sometimes the real subject appears accidentally and nobody cares about your composition. This composition makes its own rules- there are so many that work well together here. The contrast of the depth of field between the whole image and the girls heel. The flow of the eye between seeing in the restaurant and being pushed back out on the sidewalk by the curve of the element of the doorway. The push and pull of the seated mans gaze and the people walking on the right. The perspective of the building and the curve of the bench. The contrast between the open space and the crowded areas of the sidewalk. The contrast of everyone's back with the seated mans face. The light and dark of the sidewalk and the building and bench with the sidewalk as well as the contrast of those textures. The line between the tourists gaze, the kink in the map and the curve of the element in the doorway. The blonde girl and the tourists pointed finger. It is wonderful when we can capture these moments before they flee. sometimes you just see it and you don't know why yet because it's way too complicated to figure out in the time you have to take the picture before it's gone. Sometimes it happens by accident and the more you look the more you see. Wonderful image (literally).